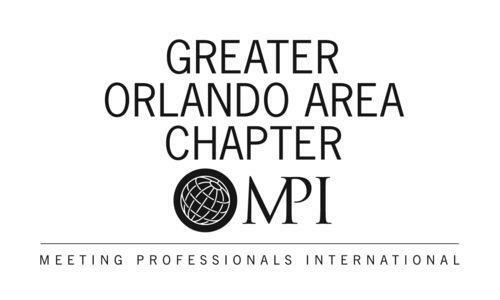 The Florida Restaurant and Lodging Show made it’s way to the Orlando County Convention Center for the 40th time this year! Restaurant and hospitality professionals swarmed the West Concourse for three days to get a taste (literally) of the newest innovations and creations sweeping the industry. Max King Events was privileged to work with Sysco Food Services in creating a “Taking It To The Streets” vibe for the booth decor. 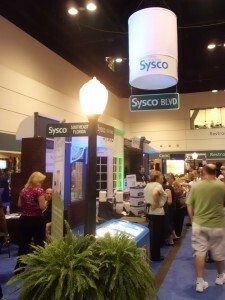 Attendees couldn’t miss the GIANT chef’s hat that marked the Sysco booth area. With the large amount of people walking through the area, it truly felt like you were experiencing a food festival in the street. 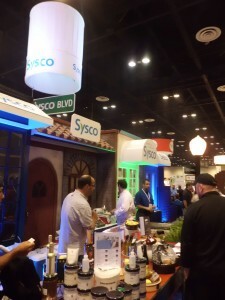 There was no shortage of food at the Sysco booth. Attendees were treated to tasty bites of pizza, seafood, cheese, pasta, cakes and ice cream…the list was never ending! The different facade backgrounds complimented the type of food that was being served. On the other side of the “street” was the Buckhead Beef display. The display was created using our mahogany panels and tile roof, flanking dark wood columns with a faux marble insert, and globe streetlamps on each of the corners. 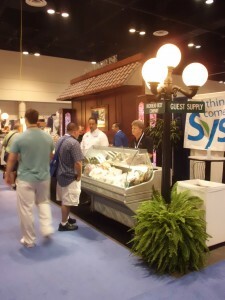 The Sysco Food Services booth was the talk of the show, and Max King Events was happy to partner with their team to make it a success!